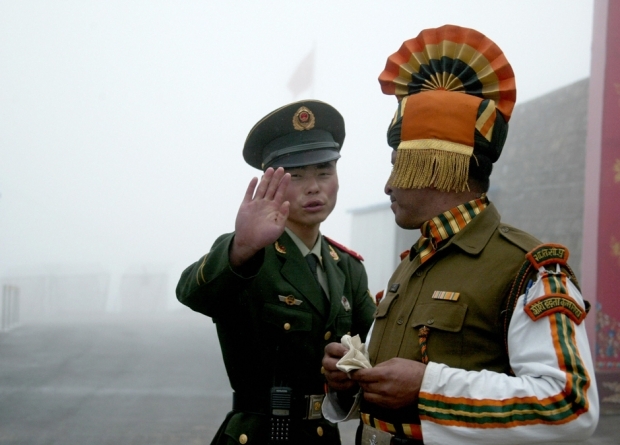 A Chinese soldier gestures as he stands near an Indian soldier on the Chinese side of the ancient Nathu La border crossing between India and China, July 10, 2008. Asia’s rising colossi share a great deal besides rich cultures, great culinary traditions, billion-plus populations, and a long border. But relations haven’t always been smooth. Have a recent round of border talks, followed up by Premier Wen Jiabao’s recent visit to New Delhi, given a new direction to Sino-Indian relations? And how has U.S. President Barack Obama’s recent visit to India been perceived in New Delhi and Beijing? On Sinica this week, Kaiser Kuo leads Stephanie Kleine-Ahlbrandt of the International Crisis Group, reporter Kathleen McLaughlin from the Bureau of National Affaris, and the Hindu’s China correspondent Ananth Krishnanin in a discussion on the state of relations between India and China. Join us for an insider podcast that goes beyond the news and into the sort of underlying analysis you won’t find anywhere else as Kaiser and crew talk about the state of security and trade on the subcontinent, and the implications of Chinese and Indian positioning for American policy in the region.